Reviews | Dramatized! Your Life a Song only YOU can Sing! God bless you Donna, and very happy for you..
Congratulations Donna, this has been a long time in the making but I knew way back when – if anyone could and would do it it would be you. I am soooooooo happy for you for launching this project!!! 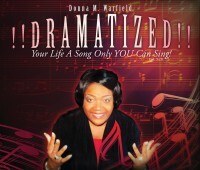 I wish you nothing but success, wealth, and happiness in the endeavors you put into getting the word out about “Dramatized” and I pray that it blesses thousands of people!!! JESUS BLESS YOU AWESOME WOMAN OF GOD. You are always up to something new and exciting. Wow Donna! Your voice is amazing! Rejoicing with you in this new project. You are a blessing! DONNA: THIS PROJECT IS AMAZING! I am so proud of you and what God is doing through you. YOU GO GIRL – All the way!!! Congratulations and best wishes on this amazing venture and expression of your ministry. May God continue to use you as he sees fit. Thanks a ton! This is an fantastic webpage! Congratulations Donna, I wish you the best God has to offer in this endeavor! What a blessing! Continue to delight yourself in in the Lord and walk with Him and He will give you the desires of your heart. Love you much! CONGRATULATIONS!! I am so happy for you and the launch of your new project. May God continue to bless you as you bless others with your gifts. I love it!!! Donna I’m so pround of you. You have been a blessing to me and now you will bless others all around the world. Congradulation!!!! I am so excited for you. I know God is going to do something great through this project. I can’t wait to hear it in it’s entirety. How exciting! God is good! Congratulations on the completion of a project that you have poured your passion, heart and soul into! How creative! I have enjoyed listening to your music and reading about you. Your work speaks for itself, I love your ability to multitask and make things happen. I can’t wait until you are back in the ATL. when we will fellowship once again.